CCFC has identified more than 1,000 acres of illegally deforested land along the Yalijux-Caquipec-Xucaneb corridor. Our reforestation initiative has pinpointed these areas, acre by acre. These land parcels range in size from 6 acres to 80 acres. CCFC is entering into reforestation / management agreements with plantation owners and cloud forest villages that will protect and restore these forests. These agreements allow CCFC to reforest with native cloud forest tree species and secure long term conservation easements on lands vulnerable to agricultural encroachment. Unlike many of our longer term community development projects, this initiative gives immediate results. We can stop deforestation before it happens or put a halt to it if it starts to happen. We are reforesting deforested areas. CCFC works smartly to maximize our per dollar impact in this and in all our projects. We use locally available seed collected from neighboring forests. We involve villages in tree planting. 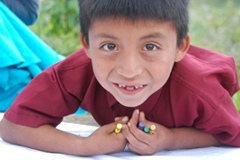 We create project “buy in” through education, field trips and employment opportunities. This project is funded an acre at a time by thoughtful and caring individuals like you. You can make it happen, sponsor an acre of restoration and conservation and help us bring back the cloud forest. The mountain village of Semesche was owned, lock-stock and barrel by Alta Verapaz’s largest coffee corporation. In the early 1990s, villagers were allowed the option to purchase their house lots, but land parcels were still legally owned by the coffee company. In 2007, thanks in part to CCFC’s advocacy, a deal was struck between the villagers and the coffee company. The deal could be described as a “land for trees” agreement. For every acre of the coffee company’s land which a family plants with trees and maintains for five years, that family receives one acre of legally registered land with deed and title. A total of 390 acres of land were reforested. CCFC provided one third of the trees in order to ensure that broad leaf trees would be included. The initial tree planting took place in 2009. Over the next several years, villagers from Semesche continued to protect and maintain the seedlings they planted. They also received deeds and titles to their parcels. The splendor and lush beauty of these cloud forests need to be shared with others. CCFC’s Community-based ecotourism initiatives help that happen. Students from Canada and the United States have participated with these remote communities in their conservation efforts. Community-based ecotourism means that income generated by ecotours goes right into the hands of the village. Ecotourism gives villages that have large areas of cloud forest an economic incentive to protect their forests. Having identified forty communities as extremely high priority, CCFC is investing in small scale, common sense initiatives that will help families live healthier lives and lessen their environmental impact on the forest. Water filtration systems eliminates the need to boil water, thus saving on firewood, time, and most importantly, carbon release. Improved cooking stoves make cooking fires many times more efficient, reduce kitchen smoke, and save firewood and time. Household solar units make electric light available so that children can study and weavers can continue to work after dark. CCFC has provided water filters to more than 60 families involved in community-based ecotourism. These water filters not only have benefitted families with improved drinking water, they have also made community visits more comfortable for visiting groups. CCFC has also assisted four families in building improved cooking stoves. These stoves are helping families. Roberto Tot reports that he is using 30% to 40% less wood than before he built his new stove. Every time chemical fertilizer prices go up, the cloud forests of the Sierra Yalijux and Sierra Sacranix are threatened. One example: When crude oil prices spiked in the summer of 2008, the local price of a 100 pound bag of chemical fertilizer (15-15-0) jumped from $10 to $46. Faced with the high cost of chemical fertilizers, some farmers opted to use less fertilizers. These farmers experienced partial to complete crop loss. The corn never filled out. Other farmers opted to slash and burn their way into better soils. On the one hand, the lush green forest appears to promise great soil but too often the reality is that once the forest is removed, soil fertility is quickly lost due to erosion on the steep and rocky slopes. Population growth, economic pressure, and land tenure issues conspire like the three weird sisters of Shakespeare’s Macbeth. According to human development statistics, the mountains of the Sierra Yalijux and Sierra Sacranix are among the poorest in Guatemala. Seeking fertile soil for corn crops, farmers are pushed up the mountain into the cloud forest. (see Q’eqchi’ Agriculture: the dark side). One way we respond to agricultural encroachments into the cloud forest is by working to improve crop production in existing fields. Improving yields on land that has already been converted to agricultural use helps take the pressure of the forest. Yields can increase as much as five fold with agroecological techniques. Generally speaking, when farmers switch to organic fertilizers they change the way they view their soil. They begin to understand their soil as a resource not just dirt. They begin to see and to celebrate soil improvements. Most farmers stop agricultural burning when they make the switch to organic. This reduces the release of atmospheric carbon and reduces the risk of accidental forest fires. Accidental fires are the second leading cause of forest loss in the Sierra Yalijux. This photo (left) shows agricultural burning in the village of Chicacnab. The farmer’s house (far left of the photo) is located at the edge of the cloud forest. His corn fields had always been below his house. With the spike in chemical fertilizer prices, the farmer turns to slashing and burning his way into the cloud forest. This work dovetails with an animal husbandry project carried out by Heifer International. CCFC is working with families that received livestock to improve their capacity to produce their own fertilizers. Farmers that switch to organic fertilizers improve their impoverished, chemical dependent soils. They improve their yields and save money. More importantly, when they produce their own fertilizers, they protect themselves against crop failure when chemical fertilizer prices go out of reach. The photo (right) shows the movement of one farmer’s corn field. The thatch roof house stands at the edge of his 2009 corn field. The farmer has moved his 2010 corn field further up the hill behind his house and into an area of 15 year old secondary forest. A close look at this photo shows the damage of the heat from burning the slash piles to the trees above his newly made field. This farmer choose to burn an area of 3-5 year secondary growth (on the hill to the right) and to slash and burn a smaller area of 15 year secondary growth (on the hill to the left). We are helping farmers be more self sufficient on their land. We want to help farmers switch from chemical fertilizers to organic. As their soils improve so does their food security. We are working to help families become better neighbors to the cloud forest.